– Corpus tool, statistic tool (Word2Vec model). – Access to the xml editing system ‘iLEX’ and the Danish resources which are edited in this system at DSL. A dictionary, a thesaurus and two computational lexicons for modern Danish sharing sense id numbers. The four resources are described in detail below. The first two are only available for research at DSL. The DDO dictionary (Den Danske Ordbog) is a comprehensive monolongual dictionary of contemporary Danish, edited at a scholarly basis. It was originally published in print in 6 volumes in the years 2003-2005, but is nowadays published online at ordnet.dk/ddo (and also as app ”Den Danske Ordbog”). Currently it involves seven editors/computational linguists and is being extended with the full description of 10,000 lemmas (2015-2018). The dictionary is edited in xml in a custom-designed structure and provides information on form, meaning and use of words belonging to the general vocabulary of Danish. The dictionary-making process is based on corpus inspection, and the development of the corpus as well as the corpus tools is part of the project. The dictionary covers 81,000 lemmas and 13,000 fixed expressions which are described by 120,000 sense definitions with identified genus proximum, and furthermore 14,000 lemmas without definition. The sense inventory, the fixed expressions, the collocations and the valency patterns have been used to compile a series of other lexical resources at DSL: the Danish Thesaurus and, together with CST/the University of Copenhagen, the two computational lexicons the Danish Wordnet DanNet and the Danish frame lexicon. All resources share sense id numbers with the dictionary. We aim at linking the DDO dictionary at either lemma and/or sense level to elder Danish dictionaries published by DSL, especially Dictionary of the Danish Language (ODS) and Old Danish Dictionary (GO). types of lexical information open up for many types of data combinations and lexical studies. The Danish Thesaurus was published in print in 2015. It is based on the lemmas and fixed expressions in the DDO dictionary, but also on the many collocations described in the dictionary. It organises most of the word senses described in DDO in 22 chapters and 888 sections and presents the words and expressions in semantic groups with keywords. In each group the words are presented in semantic order. The underlying xml-document contains formal information on the semantic groups allowing for the identification of e.g. persons, acts etc. The thesaurus, which is edited in xml, is currently being extended with the DDO senses which are not yet integrated. We hope to be able to publish an online version of the book in the next years to come, depending on funding. The most relevant parts of the thesaurus sections have already been automatically identified and integrated in the DDO online dictionary in the form of related words for many senses, based on the shared id numbers in the two resources. Its organizing of the Danish vocabulary into annotated semantic groups was used to compile the Danish FrameNet lexicon, and the two resources share sense id numbers with DDO. The linking from the thesaurus data to the other resources opens up for many types of data combinations and lexical studies. The Danish Framenet Lexicon was compiled 2016-2017 and describes 12,142 Danish lemmas with one or more frame values from the Berkeley FrameNet model. Furthermore it gives information on the type of phrases and multiword units that would typically evoke the different frames of a lemma. It was compiled in 2016-2017 in collaboration with the University of Copenhagen on the basis of the vocabulary from the Danish Thesaurus, and aims at supplying semantic annotators of Danish texts with a reduced set of frame values, typically 3-4 per verb and 1-2 per verbal noun which are most likely to be relevant out of more than 1,000 values in Berkeley FrameNet when the text is to be annotated. 671 different frames were used to describe the lemmas which represents 80 % of the DDO dictionary. It is available as a comma-separated file at github. The lexicon allows the study of different semantic groups of especially Danish verbs (and deverbal nouns), e.g. Danish motion verbs. DanNet was compiled from 2004-2013 together with the University of Copenhagen. The compilation was based on the DDO lexical data and its sense inventory, including the sense definitions and especially the fact that the genus proximum of each sense is tagged in the xml structure of the dictionary. The WordNet contains 65,000 synsets which are provided with an ontological type and a link to the closest hypernym. The synset members are linked to DDO senses. 5,000 Danish synsets are furthermore linked to the equivalent English synset in Princeton WordNet (by the relation eq_has_synonym), also labelled Princeton Core. – SemDaX: manually tagged semantic corpus. DSL is currently editing a modern Danish dictionary which is published online. The dictionary-making process includes all steps, from corpus creation, the creation of corpus tools and statistic investigations, the lemma selection based on corpus, the editing process based on corpusinvestigations, and finally the digital publishing. The sense inventory of the dictionary constitutes the skeleton to which all other DSL resources of modern Danish are linked by shared id numbers: the Danish thesaurus, the Danish WordNet and the Danish FrameNet lexicon. The thesaurus is currently being extended with senses from the dictionary in order to cover the full sense inventory. The linked data is already used for different purposes, one of which is the integration of related words from the thesaurus into the dictionary sense desriptions. In the ELEXIS project, we carry out research on how to link dictionaries of elder Danish to the modern resources. 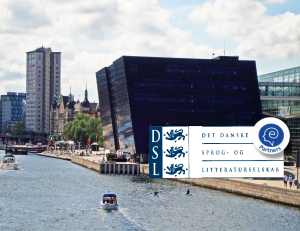 Since 2008 DSL has specialized in digitising and online publishing historic Danish dictionaries, as well as dictionaries that have been published by DSL only in print. In some cases the online publishing includes an app version. Two computational linguists are involved in this work. The first (and most comprehensive) online published Danish dictionary is still being developed with even more fine-grained tags based on the typography of the printed version. Also a new Swedish-Danish dictionary published in 2010 is to be published online in 2018 (and we plan to publish the Danish Thesaurus in the years to come, probably before 2021, depending on funding). Detailed information on the dictionaries can be found here.